This was a very special Valentine’s Day for lovers of industrial music. 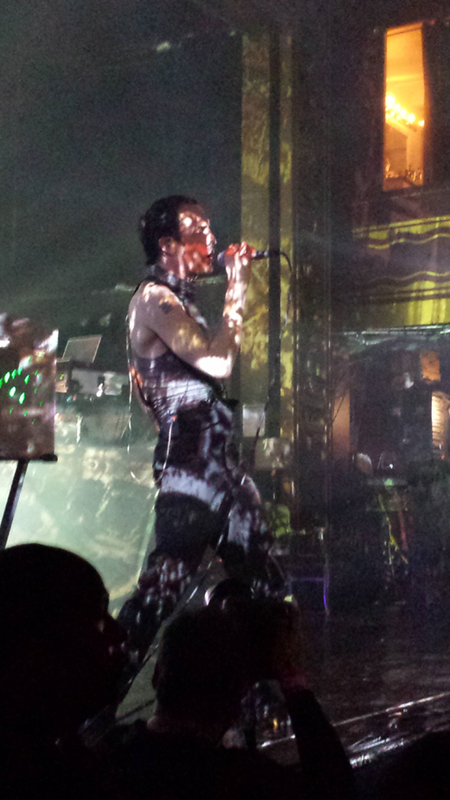 The object of their love, Skinny Puppy made this a most fulfilling holiday to a sell-out crowd of their fanatical metropolitan area followers. The backdrop and the performers were flooded with a crazy-quilt of broken, animated lighting that was disorienting and hallucinatory. 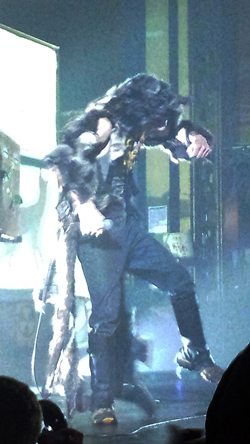 A model of a slender canine appeared in silhouette on the stage and would later serve briefly as stage prop. “Village” from the “Handover” album and the classic “The Choke” from the 1985 “Bites” album followed, then back to “Weapon” for “plasicage” and “wornin’.” A screen on stage ran LED figures displaying the rapidly-growing national debt at $55 trillion and mounting while images of electronic circuit boards, disasters, chaos and op-art flashed behind the stage performers. “Deep Down Trauma Hounds” from the 1987 “Cleanse Fold and Manipulate” album provided a welcomed return to the classics as did their all-time favorite, “Warlock,” the uniquely cadenced, compelling and mesmerizing hit from the “Rabies” album. Throughout the concert, no effort was spared as Ogre donned, now a furry costume, then a hazmat suit, another terrifying headdress or two and poured himself and drank a tall glass of some repulsive, phosphorescent blue-green liquid. As always, Skinny Puppy was magnanimous in the generous and unbounded efforts to please, entertain and shock their zealous and loving fans, for whom this will always be a Valentine’s Day to remember.